Hello, everyone! I'm so glad that you've stopped by today as I share my projects for the October Paper Sweeties New Release along with my talented team members. I'm sharing a card and coordinating tag that uses our sweet new Home Is Where Your Story Begins Stamp Set and coordinating Home Is Where Your Story Begins Sweet Cuts. For my card, I used a kraft card base and attached some peachy Bazzill paper with more kraft paper that I sewed together with patterned papers. Once I had those all lined up, I stamped the house, tree, and bird onto coordinating patterned papers and cut them with the Sweet Cuts. 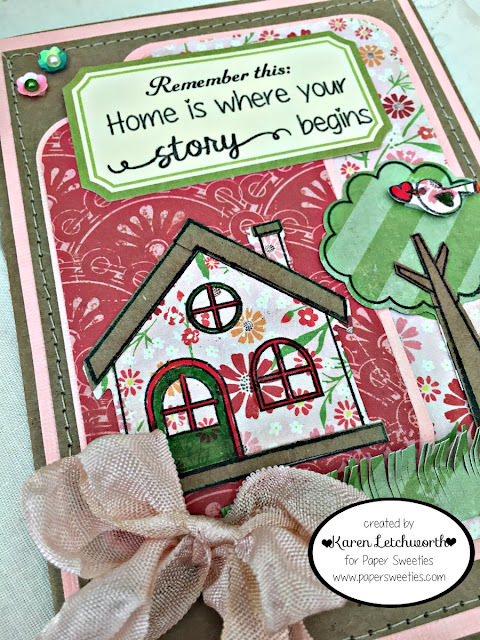 I also added the sentiment (Home is where your story begins) from this sweet stamp set by stamping it onto a journalling sticker that (already) said "Remember this:", and also added a double bow that's tied with Sugar Sprinkles Seam Binding. The finishing touch to my card were some Creamsicle Sequins and Green Apple Sequins. The "grass" was just hand-cut with my scissors. Isn't that bird up in the tree adorable? All the stamps in this set are SO super cute. 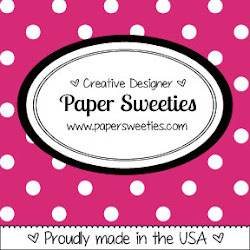 And as always, this set is amazing on its own; or when used in conjunction with other Paper Sweeties products. I made this set for my daughter and son-in-law who are in the process of moving. When she saw the set, she asked me if I could make a dozen of these to send out to let people know their new address (#newaddress). Yikes! I'm going to be busy, huh? 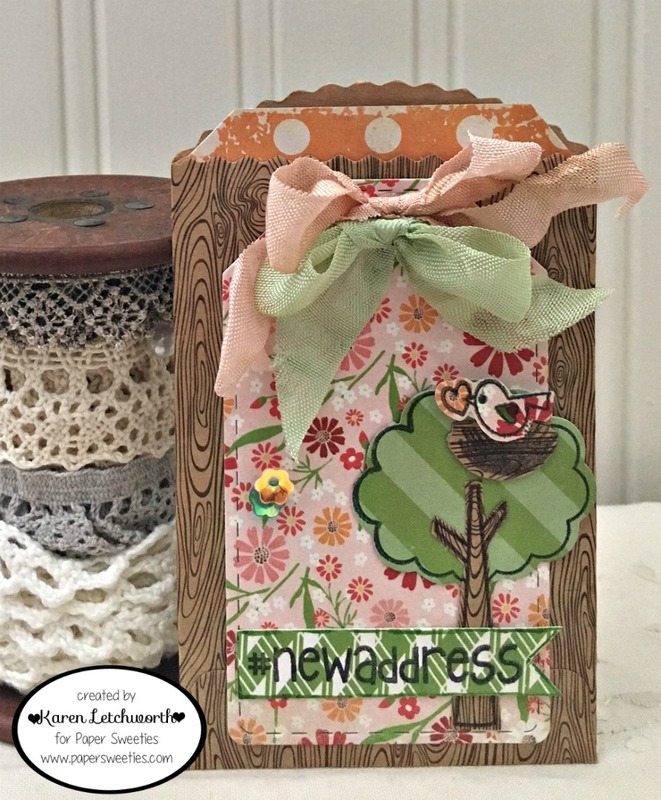 I used a little wood-grain envelope and attached a tag that I cut using the brand new Tag Sweet Cuts. 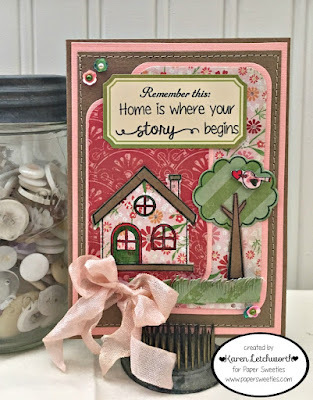 I also stamped the tree, nest, bird and sentiment using the new Home Is Where Your Story Begins Stamp Set and cut them using the coordinating Home Is Where Your Story Begins Sweet Cuts. I added a bow made with the Sugar Sprinkles Seam Binding and Mint Seam Binding; and again added Creamsicle Sequins and Green Apple Sequins. 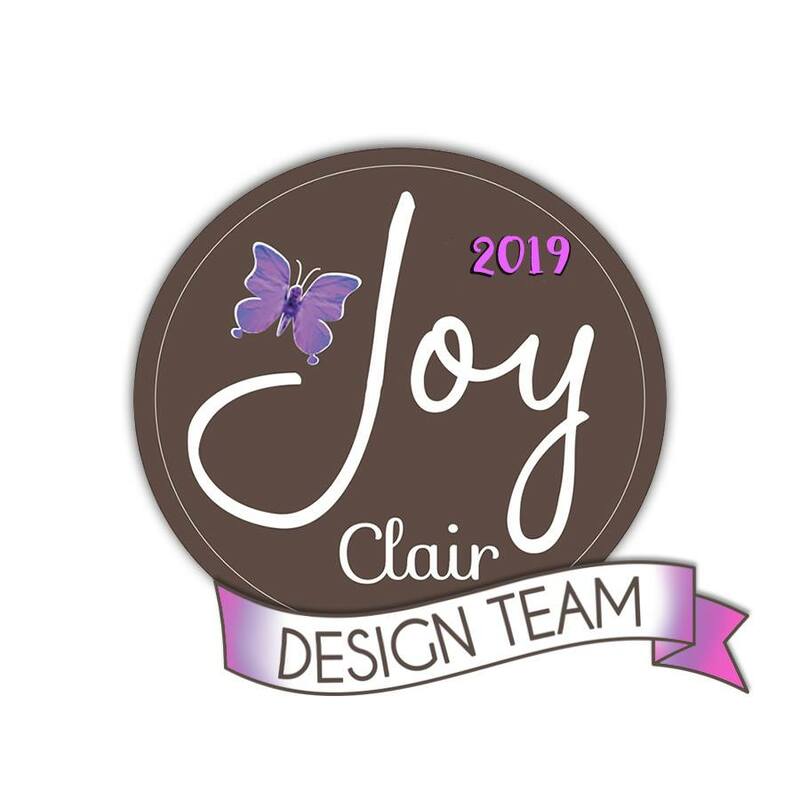 Here's the list of my talented team-mates from Paper Sweeties who have created something lovely to inspire you today. These two FABULOUS new sets are available for sale as of today in the Paper Sweeties Shop. You won't want to wait to get yours...they're just SO cute! 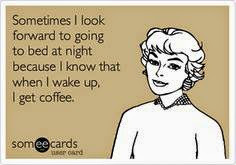 Thanks for visiting, and I look forward to seeing you again tomorrow. 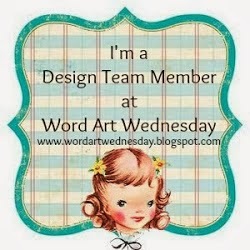 Just Keep On Creating - October Linky-Up Party - Special thanks to Susan for this fun challenge. Come, play along! 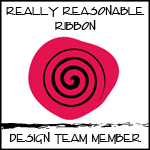 Karen, your card and tag are gorgeous. That is a beautiful new release. Lovely card with tag!! Very pretty double bows and beautiful patterned papers! Love the detail for the grass, too!! Adorable card and tag, so cute and sweet! 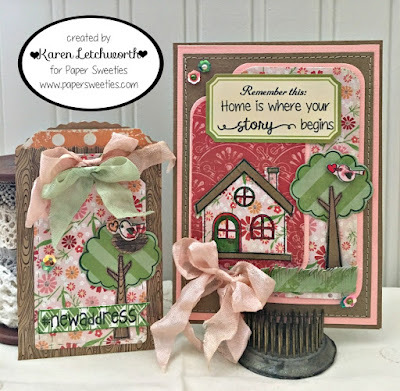 What a gorgeous set Karen - love the stamping on the patterned paper - you have created a beautiful wee scene.